-NLC has urged the Federal Government of Nigeria to implement the new minimum wage agreed in their last meeting. 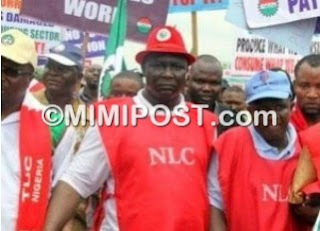 -NLC also said that failure to implement the wage will lead to a prolonged strike. Since the Nigeria Government has failed to meet up with its agreement with the National Labour Congress over the minimum wage issues, as a result of the Federal Government inability to implement the agreed wag. NLC has stated that its shall embark on a prolonged strike which will commence from the 8th of January 2019. Following the inability of the Federal Government to urgently transmit the bill on the new national minimum wage to the National Assembly, the Nigeria Labour Congress has set January 8th as the date for the commencement of an indefinite nationwide strike. Comrade Wabba called on Federal Government to urgently transmit the bill on the new national minimum wage to the National Assembly for a speedy passage. “It is unfortunate that the Federal Government is yet to transmit to the National Assembly an executive bill for the enactment of N30,000 as the new national minimum wage. Government’s dilly-dallying on the issue has strained Government-Labour relations with a potential for a major national strike which could just be days away. “The new year presents great opportunities for workers, pensioners, civil society allies and their friends and families to put their numbers to good use. This is by voting out, not on the basis of tribe or religion but purely policy, any candidate that cannot serve their interest. In the year that is ahead of us, the NLC remains unequivocally committed to the national and workers’ goals which include the campaign for industrialisation, against selective enforcement of “No Work, No Pay” policy of government, among others,” he said.